All three of our three bedroom, two bath Assistant Keeper’s homes sleep six, and include a wood burning fireplace (firewood provided) in the living room, fully stocked kitchen, dining room, satellite television, CD/DVD player, free Wi-Fi, gas or electric fireplace in the master bedroom, back patio with picnic table and incredible views of the California coast from every room. These homes feature two queen beds and two twin beds, all with Tempur-Pedic mattresses. Assistant Keeper’s houses 2 & 3 are pet friendly. Our new showplace, Assistant Keeper’s House 4, is a fully renovated and re-imagined home with gourmet chef’s kitchen, beautifully furnished living and dining rooms, custom tile baths, designer furniture and linens in all bedrooms, unique art and decorative features and more. Check out the “Over the Top” review on TripAdvisor from our first guests and the “Awesome Accomodations” review from a repeat guest! All of our rentals include unlimited Lighthouse Museum & Tower tours and full access to our 23 acres of grounds for all guests during their stay. You will also find a welcome gift of a bottle of Husch Vineyards wine and chocolates from Mendocino Chocolate Company waiting for you in the dining room of your Assistant Keeper’s home. The Head Keeper’s House features one bedroom and one bath, a wood burning fireplace (firewood provided) in the living room, fully stocked kitchen, dining room, satellite television, CD/DVD player, free Wi-Fi, back patio with picnic table (shared with Keeper’s Apartment) and majestic views of the Pacific from every room. This rental features one queen bed with Tempur-Pedic mattress and a sleeper sofa in the living room. Pets are not allowed in this unit. All of our rentals include unlimited Lighthouse Museum & Tower tours and full access to our 23 acres of grounds for all guests during their stay. You will also find a welcome gift of a bottle of Husch Vineyards wine and chocolates from Mendocino Chocolate Company waiting for you in the dining room. 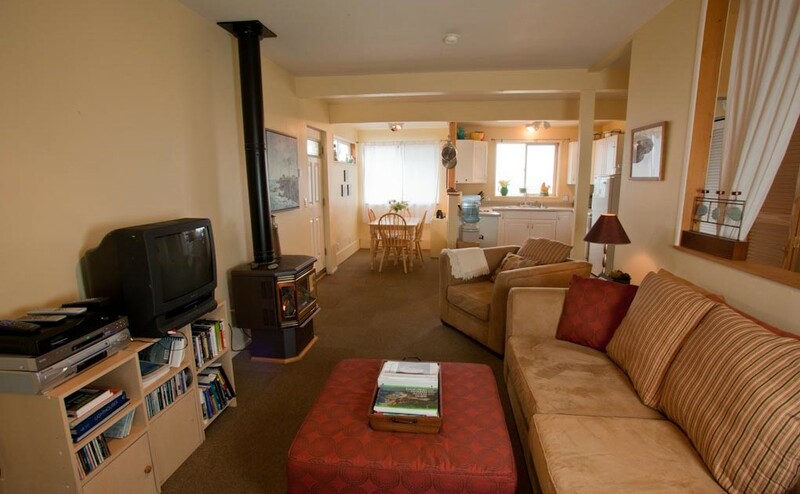 Our most romantic option, the Lighthouse Keeper’s Apartment is ideal for two people. It is also listed on SFGATE as one of the Top 10 Unique Vacation Rentals in the West! A bedroom featuring a queen bed with Tempur-Pedic mattress, private bath, fully stocked kitchen, dining room, living room with electric fireplace, satellite television, CD/DVD player, free Wi-Fi, back patio with picnic table (shared with Head Keeper’s House 1) and, of course, spectacular ocean views. Pets are not allowed in this unit. Our Keeper’s Room is a cozy space for two that includes satellite television, CD/DVD player, gas fireplace, private bath, small seating area, mini-fridge and microwave and a full view of the ocean, bluffs, and lighthouse — even from the comfort of the queen bed with Tempur-Pedic mattress. There is no kitchen in the Keeper’s Room and pets are not allowed in this unit. All of our rentals include unlimited Lighthouse Museum & Tower tours and full access to our 23 acres of grounds for all guests during their stay. You will also find a welcome gift of a bottle of Husch Vineyards wine and chocolates from Mendocino Chocolate Company waiting for you in the sitting area by the front door. *Rates do not include taxes, cleaning charges or pet charges. For all units except the Keeper’s Room there is a 2 night minimum stay on weekends (Fri & Sat). For all units there is a 3 night minimum stay on Presidents Day, 4th of July, Memorial and Labor Day weekends and between December 24 – 31, and 4 night minimum stay for Thanksgiving weekend. Higher rates apply during holiday periods. Point Arena Lighthouse Keepers members receive a 10%-25% discount on lodging (Holidays excluded, cannot be combined with the Seasonal Special or any other Specials/Discounts unless otherwise noted). Cleaning charges are assessed per stay for cleaning the unit after guest check out, regardless of the length of stay. These will be collected as part of the reservation deposit, and will be fully refunded if you cancel reservation before arrival. Pets are welcome in Assistant Keeper’s Houses 2 & 3. The charge is $25 per pet, maximum of 3 pets per house. These will be collected as part of the reservation deposit, and will be fully refunded if you cancel your reservation before arrival. Please note that all dogs must be on leash when outside of the vacation home, and dogs should not be left in the homes when you go out. We also expect your dogs to be kept quiet, particularly in the evenings, as a courtesy to our other guests. We are a small, nonprofit organization and do not have the ability to recover from cancellations that larger hotels do, so we have the following cancellation policy. Your understanding in this regard is greatly appreciated. Only the rental rates are used to calculate cancellation charges. All Cleaning Charges, Pet Charges, and Lodging Taxes will be refunded to the customer, only the rental rates are calculated into the cancellation charges. 31 days or more before arrival: $100 Cancellation Charge charged, balance of deposit is refunded. Less than 31 days (15-30 days): 50% of your full reservation amount charged, balance of deposit is refunded. Less than 15 days (0-14 days): 100% Cancellation Charge (No Rental Rate Refunds). 31 days or more before arrival: $50 Rebooking Charge will be charged in lieu of the $100 Cancellation Charge. Less than 31 days (15-30 days): $50 Rebooking Charge and $50 per reservation day charged in lieu of 50% Cancellation Charge. Less than 15 days (0-14 days): No Rebooking option offered. If you have rebooked your reservation once and need to cancel or rebook again, you will be charged the appropriate cancellation charge as detailed in the Cancellation Policy above.